Hermle offer the SALCOME 35065-000132 Ships Bell Wall Clock,in a Brass finish. 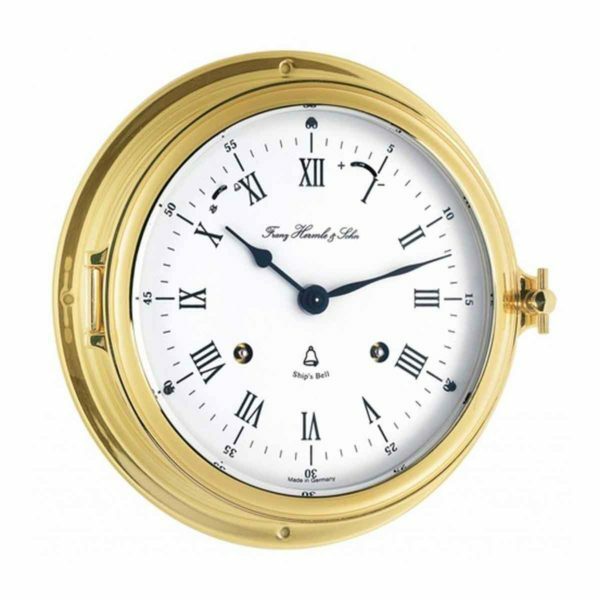 A Nautical ships bell clock with a solid brass bezel, and a double time track showing the hours in Roman numerals together with a numerical minute display. Movement: Hermle jewelled 8-day mechanical ships bell movement with shut-off, strike on bell. Free delivery to any UK address. Hermle clocks are ordered from the manufacturer, normal delivery is within seven working days, on occasion this can be extended due to availabiliy of production stock. Hermle offer the SALCOME 35065-000132 Ships Bell Wall Clock,in a Brass finish. 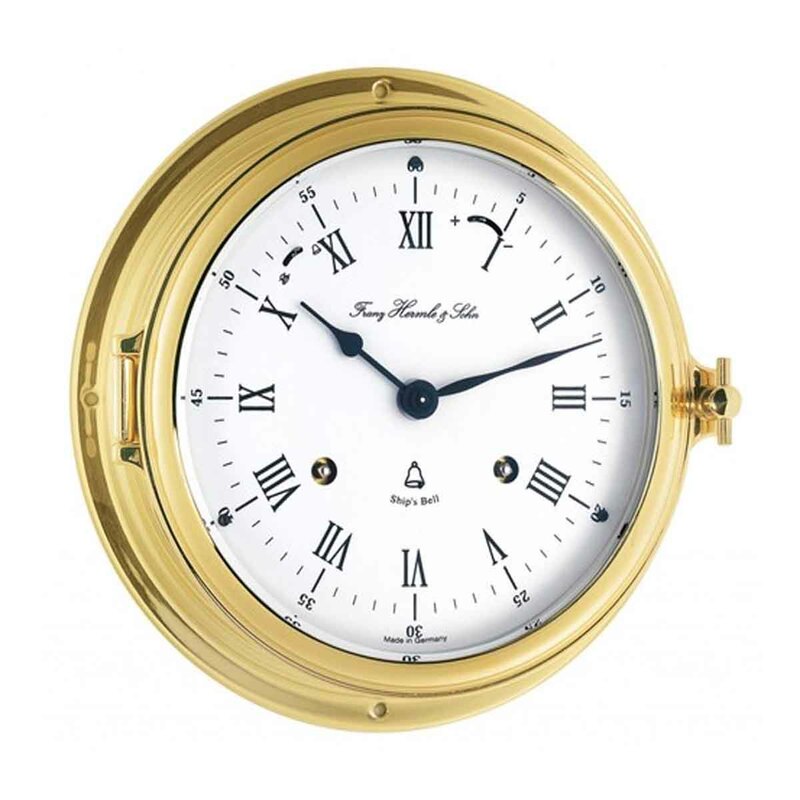 A Nautical ships bell clock with a solid brass bezel, and a double time track showing the hours in Roman numerals together with a numerical minute display. The family-run enterprise of Hermle began nearly 100 years ago in Gosheim, in South Germany’s Schwäbische Alb region; which ranks as Europe’s main centre of machining technology and was once the centre of the German clock and watch industry. The mechanical clockworks that lie at the heart of all Hermle clocks as well as clocks made by other manufacturers (including Clocks & Chimes) are produced in Reichenbach, very close to Gosheim. From there, Hermle manufactures and delivers high-quality floor clocks, wall clocks, table clocks, ship’s clocks and regulators around the world. While the classic floor clocks – based on the interiors of an important century – bring the culture and lifestyle of past times back to life, the design floor clocks from Hermle represent creativity, purism and innovation. Table clocks from Hermle are beautifully shaped ornaments, and leave a lasting impression. The regulator wall clocks are beautiful and uncomplicated, and their clear lines and total technical perfection are quite timeless. Minimalist design and timeless modernity blend together, making Hermle clocks into technological miracles.